The class is co-taught by Associate Professors Jesse Kwiek of microbiology and Thomas McDow of history. The course studies the global and historical expansion of HIV, as well as its evolution at a molecular level. Beginning in 2014, the College of Arts and Sciences challenged faculty to develop interdisciplinary, team-taught courses. The idea was to take strengths of the college’s wide-ranging academics to shed light on subjects from a variety of angles. Both McDow and Kwiek knew each other socially and had conducted research in East Africa. The idea to form an HIV-related course that drew from both professors’ expertise quickly blossomed. When formulating the class, transitioning between what Kwiek and McDow both wanted to share was a unique undertaking. They wanted the curriculum to have a balanced feel between HIV’s historical and microbiological perspectives. McDow approaches the course from an archival perspective, delving into global historical accounts of the HIV epidemic. By studying the social, economic and political conditions of different regions of the world over the years, students explore how the virus’s path has been influenced through time. Kwiek examines the physical progression of HIV and analyzes the trail of its existence and evolution through a microbiological context. How does the HIV microbe cause disease? What is the virus-host interaction? Why isn’t there an effective vaccine for the virus? Questions like these are asked and discussed. McDow and Kwiek combine their two approaches, and they intersect seamlessly over the course their lectures. Instead of McDow explaining HIV’s global history one day and then Kwiek delving into HIV’s microbial evolution the next day, both professors work in tandem to present their material harmoniously. Over its past four iterations, the course has gained in popularity. Originally capped at 60 students, it is now capped at 80, and McDow says it has a waiting list each semester. The integrative nature of the course attracts students from all different walks of academic interests. Course participants hail from a variety of majors, including molecular genetics, microbiology, linguistics and history. Drawing from multiple arenas of expertise and examining a topic through various contexts isn’t just a viable approach to learning about HIV. The course helps students realize the benefits of approaching other fields with a broader mindset. Jessica Hoopengardner is a fourth-year microbiology major minoring in leadership studies and Italian. She took the class last spring after a friend of hers who took the class reported back how much she loved it. Though she’s a microbiology major, she’d always been fascinated by history, and she thought the class was a great bridge between what she was studying and what she was interested in. She enjoyed tackling a topic from two viewpoints and seeing McDow and Kwiek play of each other and switch back and forth during lectures to teach the material. “My biggest take way from the class is that our world is interdisciplinary and global,” Hoopengardner said. 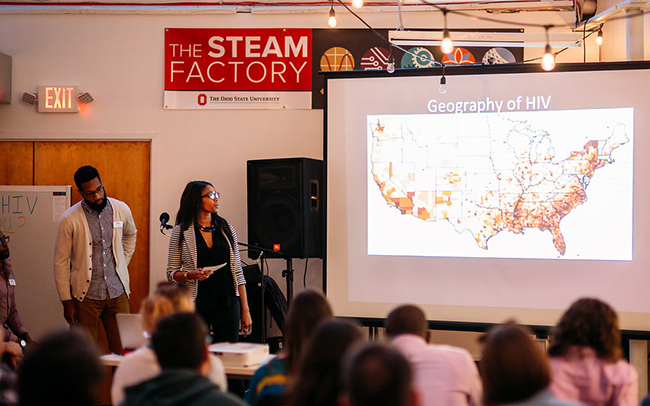 The course concludes with students conducting a group presentation at the STEAM Factory downtown using a PechaKucha-style format, in which 20 PowerPoint slides are shown for 20 seconds at a time, keeping the presentation concise and fast-paced. Hoopengardner’s presentation was about how needle-exchange programs help reduce the transmission of HIV. The event attracts representatives from local health organizations such as the Ohio Department of Health, Columbus Public Health and Equitas Health. A study abroad course spun off the original class, and in summer 2017, 15 students traveled to the Tanzanian Southern Highlands, a region with one of the highest rates of HIV in the country. The study abroad course will commence again in the summer of 2019. Between the course’s curriculum, the event at the STEAM Factory and the corresponding study abroad class, Kwiek and McDow have steadily turned what was once simply an idea into a multifaceted and comprehensive student experience.